I have reviewed ChicoBags reusable bags in the past and loved them so much that I contacted the company again to do another review. They are reusable bags that fit into a tiny pouch that is attached to the bag. I use my ChicoBag for different things including weekend trips, an extra bag to haul books, or groceries. They are surprisingly strong for such a lightweight bag. I love that they can become so compact so they are very easy to transport anywhere. Sometimes, I will bring one of these in it's little pouch in case I need an extra bag. They are also easy to wash. Once, I left some ripe fruit in the bag and it got smashed and washed out very easily. 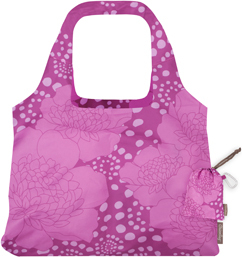 This Vita Blossom Lotus Flower bag retails for $12.99. It is able to carry up to 40 lbs which is amazing. The company sells all different patterns and bag shapes and sizes. I love that they have girly patterns as well as manly or neutral ones. The other ChicoBags that I have are hot pink and purple polka dot which is awesome. My other ChicoBags have lasted me between 1-2 years so far and hold up their appearance over time. Check out ChicoBags for a portable, easy bag to use. Although I have never heard of this brand, but the bag seems very beautiful and stylish. Pink is my favorite color. A few months back I purchased the same bag from Kilkenny shop, but color is different. I really like its stuff and design.